Introducing Our New Pediatric Scales! Over the past several years we have introduced a number of new medical scales for a wide range of applications; from stand-on scales to extra-large in-floor dialysis and wall mount scales. The next area we wanted to update was our line of pediatric scales. So over the past several months we have been developing a new pediatric scale to address this need in our product line. Early feedback from a number of hospital systems has been positive. If your medical facility would like an onsite evaluation of one of these new pediatric scales, please call our office to schedule an appointment at your location, 800-654-6360, or email us at info-request.com. This entry was posted in Uncategorized on February 28, 2019 by Will Smith. Last fall we introduced an antimicrobial additive to our scales. This is now a standard feature in all our stand-on, wheelchair, and wall mount scales (and at no additional cost). Over the past several months we’ve attended a number of medical events showcasing these new SR Scales with Microban® antimicrobial product protection. The response has been overwhelmingly supportive of this exciting development. To learn more on how the antimicrobial technology works, you can download a free White Paper from our website http://bit.ly/SR-Scales-Antimicrobial-WP. This month, we’ll be attending APIC 2018 in Minneapolis, MN (June 13 – 15, 2018). The Association for Professionals in Infection Control and Epidemiology’s (APIC) annual conference is the largest event of its kind for medical professionals specializing in infection prevention. More info on APIC can be accessed from the APIC website: http://ac2018.site.apic.org/. We’ll be in booth # 607. We cordially invite you to stop by and demo some of our antimicrobial scales. See you there! This entry was posted in Uncategorized on June 7, 2018 by Will Smith. Here at SR, we’ve been building in-floor scales for decades. Our two primary models offered flexible sizes for weighing applications in dialysis centers and hospitals needing to weigh patients in wheelchairs or with walkers. This week we are announcing the availability of our largest in-floor weighing system to date – the SR463iR-4. The new built-in scale measures 4’ x 6’, can weigh patients in bariatric wheelchairs or hospital stretchers, and all with .1% accuracy. This brings our number of in-floor scale systems to three highly accurate scales. The wall mounted rotating display can be ordered with a built-in printer for confirmation of a patient’s weight. Standard for all our in-floor systems, our product warranty is four years. For more information on these made in the USA scales, you can access our press release at http://bit.ly/SR-Scales-SR463iR-4-PR or call us at 800-654-6360. This entry was posted in Uncategorized on March 28, 2018 by Will Smith. This week we are excited to share that we have officially launched our antimicrobial scales featuring Microban® technology. 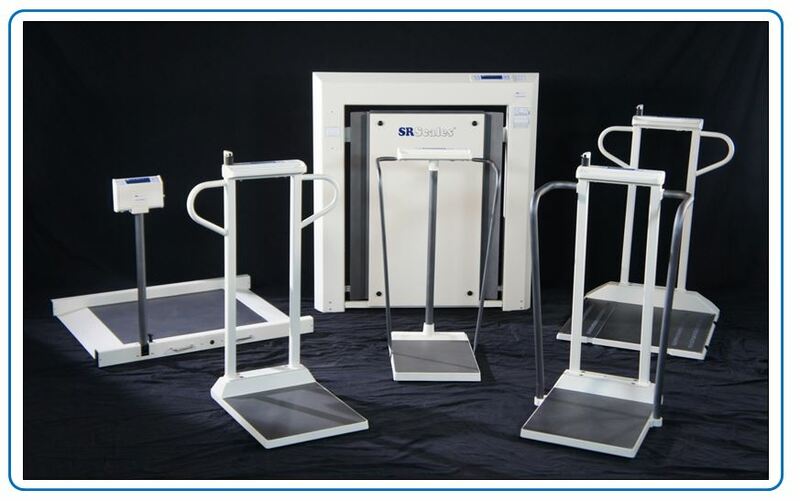 SR Scales infused with Microban technology feature added protection against the growth of bacteria and the technology will be included in all our medical stand-on, wheelchair, and wall mount scales at no additional cost. As hospitals and medical centers with multiple locations seek to standardize on scales throughout their facilities, SR Scales provide a wide range antimicrobial products to select from for most every weighing application. SR Scales infused with Microban do not replace existing cleaning practices at medical facilities, but rather complement existing cleaning protocols. Surface areas that contain the antimicrobial protection include the platform, handrails, stanchions, display housing, keypad, and visible labeling. This entry was posted in Uncategorized on October 20, 2017 by Will Smith. Wall Mount Scales – Which One is Right for Your Facility? This week we announced in a press release the introduction of our newest member of wall mount scales, the SR7020i extra-large wall mount hospital stretcher scale. This brings our current lineup of space-saving wall mount scales to three models to choose from. So, which one is right for your facility? That depends upon your applications and where the scale is to be used. They all occupy less than four inches (4”) of wall space when not in use as the weighing platforms easily fold up against the wall. This helps keep hallways clear for people, staff, and equipment being transported. They all have gas-assist springs for lowering and raising the platforms, making it safe and easy for caregivers to weigh patients. Each of these scales comes with the longest warranty in the industry: FOUR YEARS. They all have a 1,000 lb capacity, and have the option for a printer output or serial data output for EHR systems. The SR7000i wall mount wheelchair scale is primarily used in environments like dialysis centers or long-term care facilities to monitor weight of patients restricted to wheelchairs. Wheelchair access can be for standard-sized devices or bariatric wheelchairs with a wheelbase of up to 40”. Top weighing surface is 24” x 40.75”. A video of the scale can be assessed here http://bit.ly/SR-Scales-SR7000i. The SR7010i is an ambulance gurney wall mount scale that is primarily designed for busy ER centers where incoming patients can be weighed on ambulance gurneys as needed. Of course, standard wheelchair weighing along with ambulatory patients can also be accommodated on this platform. Top weighing surface is 38” x 48”. For more information, you can see the product video here http://bit.ly/SR-Scales-SR7010i. This entry was posted in Uncategorized on August 3, 2017 by Will Smith. Product of the Month – the SR755i, multi-purpose scale: a true workhorse for your hospital! Over the years we’ve seen many of our scales develop positive reputations in the medical community. One such scale that has been steadily relied upon by a variety of departments is the SR755i Multi-purpose Wheelchair scale. This workhorse of a product has won the admiration of both nursing staff and biomedical personnel with its numerous features and rugged durability. In fact, we recently took one in for repair. We knew it was old from the model number which was a predecessor to the SR755i; same base but older display. However we didn’t know how old it was until we researched it and found it to be 20 years old! The scale was in remarkably good condition and repairs were only minor. We needed to recalibrate the load cells in the platform and replace the feet on the base of the unit. Once completed, the scale was ready to go and was shipped back to its owner with a new calibration certificate. • Large 28” x 28” base, making it ideal as a bariatric stand-on scale (1000 lb capacity). • Fold down ramps enable it to become an accurate wheelchair scale. • Easy and safe for staff to transport from room to room with its “Tip and Go!” wheels and light-weight cast aluminum frame. • Support handles are part of the weight surface, enabling patients to comfortably hold on for stability without affecting the weighing process. • Made in the USA with a FOUR YEAR warranty – providing an improved ROI for purchasing departments. If your facility would like to evaluate an SR755i, give us a call at 716-693-5977 to arrange an onsite demonstration meeting with one of our nationwide representatives. This entry was posted in Uncategorized on May 23, 2017 by Will Smith. Product of the Month – the SR241: Portable & Perfect for House Calls! Remember the old slogan, “Two for the price of one?” That’s how we arrived at the model number for one of our more intriguing scales, the SR241 (two-for-one). This portable, road-worthy scale was designed for medical professionals who need to have a lightweight scale that can double as a pediatric scale as well as a patient stand-on scale. All of these requirements were met with the dual purpose weighing system we call the SR241. This unique scale features a removable baby tray. 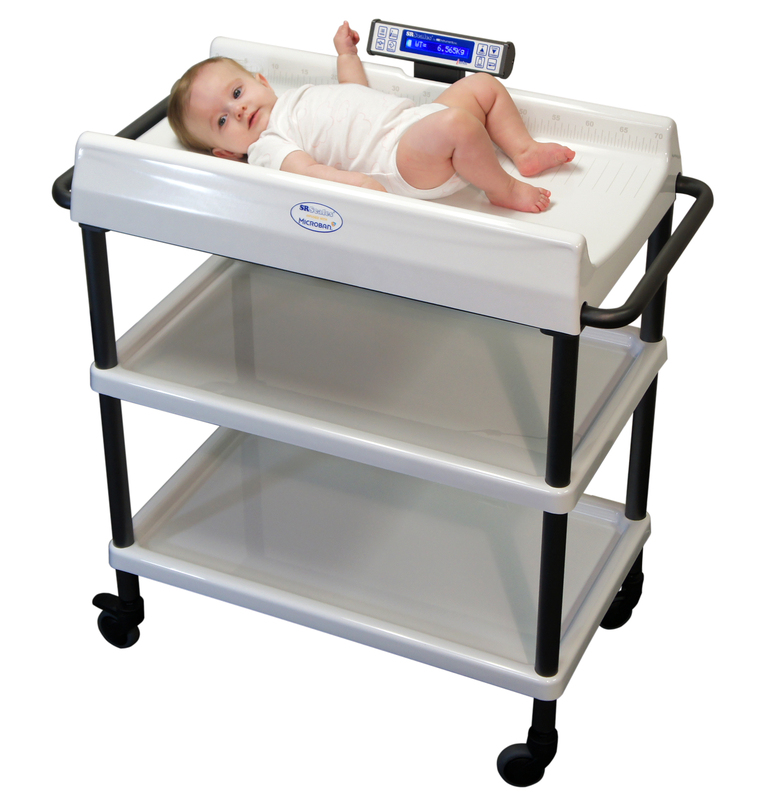 So after weighing adults, the slide-on tray can be quickly added to take an infant’s weight. As a special add-on feature we call “Baby-Mode”, a parent can stand on the scale and the parent’s weight is then zeroed out. Next, the parent can be given their infant to hold which permits the scale to easily obtain the baby’s weight. If your facility would like to evaluate an SR241, give us a call at 716-693-5977 to arrange an onsite demonstration meeting with one of our nationwide representatives. This entry was posted in Uncategorized on February 27, 2017 by Will Smith. Here at SR we’re always interested in building improvements to our products. Our customers, whether they’re in the medical profession, or members of veterinary and zoological organizations, are a great source for new ideas and suggestions for products and innovative updates. Recently we decided to take look at the coating compound on a few of our portable and in-floor veterinarian scales. We wanted to find a newer material that would be long lasting, easy to clean, and offer an improved non-slip surface for animals. We’ve come up with a new compound and will be showcasing a number of scales with the new coating at next week’s NAVC (North American Veterinary Community) 2017 Conference in Orlando, FL. We welcome feedback on the new coating from veterinary professionals who are attending the event. So stop by booth # 500, check out the new coating, and let us know what you think. You may also want to see our new small to mid-sized animal scale, the SRV411i, a.k.a. the Dog Bone Scale. Hope to see you there! This entry was posted in Uncategorized on February 3, 2017 by Will Smith. Ah yes – another escape from the arctic cold we are used to in Western NY! Truth be told, it has been a milder winter here in the greater Buffalo, NY area up to now, but still – it was nice to get away down south for a road show in January. Last week we kicked off our winter 2017 trade show season with a visit to Austin, TX for the 2017 Texas Hospital Association’s Annual Conference and Expo. And even though the temperature was in the 50s for most of the week in Austin, it still felt better than the 30s we had in upstate NY. This was our first time exhibiting at the premier THA (Texas Hospital Association) event. From THA’s website, the Association represents more than 85 percent of the state’s acute-care hospitals and health care systems. This event presented a great opportunity for us to introduce our SR Medical Scales to the executive leaders at many of the member hospitals. We took our “Trade Show in A Box” display which allows us to demonstrate several of our more popular medical scales to the attendees. For this event, we demonstrated a cross-section of our medical scales, starting with our ultra-wide Patient Floor Scale, the SR411i. Next we had available our newly launched SR585i Stand-on Scale. This scale, which features a wide base, 1,000 lb capacity, and easy-to-grip wrap around handles, is gaining in popularity at hospitals around the country for gathering weight data where patients need to grasp a handrail for support. Centering our booth display is the very popular mid-sized wall mount stretcher scale, the SR7010i. Beyond our medical scales, we will be attending a variety of events this winter that also include our other markets, that of veterinarian and waterparks. You can see our winter show schedule below as well as on our Events webpage. We hope to see you there! This entry was posted in Uncategorized on January 31, 2017 by Will Smith. Our product focus for January is our space-saving wall mount scale, the SR7010i. The story behind this product’s development reflects our commitment to custom-building scales to meet the requirements of our customers, be they in the medical market or the other markets we serve (Veterinarian, Zoological, and Waterparks). A hospital representative contacted us after learning about our medical scales. They were looking for a new approach to handle their patient weighing requirements in a way that would allow them to have a single device that would be able to weigh patients in various stages of ambulatory care. Specifically, they wanted to have a device that could be used in place of ordering several scales such as a patient/bed lift scale, a wheel chair scale, and a stand-on scale that could accommodate a patient using a walker. One other important design feature that was needed was to have the new scale able to be easily stored away when not in use. So our team of design engineers built a large platform scale that was able to support a thousand pounds. Using gas-powered springs, the platform could be easily lowered then raised up for storage when staff had finished weighing patients. The scale’s space-saving design took up less than five inches of wall space when not in use. The weighing surface of the new scale is large enough to accommodate a stretcher, handle motorized wheelchairs, and yet easy enough for a patient using a walker to stand on the platform. Once completed, the new weighing system was installed and ready for active use. The project was so successful, that additional units were ordered and placed in strategic locations throughout the facility. Backing up the product’s durability is our 4-year warranty, the longest product warranty in the medical scale industry. You can learn more about this device including a short video at: http://bit.ly/SR7010-info. If you have a need for a custom weighing solution at your hospital, you can contact us at 716-693-5977 to discuss how we can build the right solution for you, your staff, and your patients.